A crayon lives his life labeled red but he colors everything blue. He is told to "try again" when he colors strawberries incorrectly, asked to put on a scarf to "warm up" when he can't combine with yellow to make orange. Others say he's being lazy, not applying himself, and that he'll catch on if given more time. The truth of the matter is, red was mislabeled. He can't color a strawberry properly because that's not who he is. But he can color blue jeans, the ocean, and the sky! The entire time I was reading Red I couldn't get the above Albert Einstein quote out of my head. We put so many kids in boxes, forcing them to be something they're not, when all this time we've been asking them to be the color red when they're really blue on the inside. This picture book is one of the best journal prompts I have come across in the long time. In addition to the Albert Einstein quote, after reading Red to my 8th graders, I'm going to ask them to respond to this question: Have you ever been labeled red in your life when you were really blue? In addition to the really powerful message Red drives home to readers, what is also endearing about this book is the whimsical, amusing touches Michael Hall adds to the illustrations. For example, the parent and grandparent crayons in the story are shorter rather than taller, presumably because for the life of a crayon, if you're older you've been used more and so you're shorter than a brand new, out-of-the-box crayon. 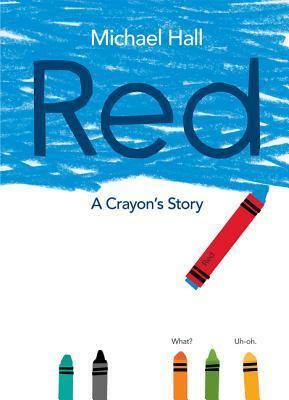 Red is a book that can spark discussions in classrooms of all ages, not just primary grades. I can picture really deep discussions happening in high school classrooms since that is a time fraught with labels.